In earlier days, most of the people were using handwritten letter as a way of communication. But, sending a letter manually takes a lot of time. Later on, when the internet comes into play, this mode of communication changes steadily. As time passes, people prefer emails over the handwritten letter. Nowadays, emails are the best way to convey messages to another person rapidly. In organizations, it is considered as a formal mode of communication between the employees. There are a number of email applications available in the digital world. However, one of reliable and secure application is IBM Notes. Lotus Notes has been one of the first groupware products to hit the market way back in 1989. And, it has continued to dominate the groupware market. Lotus Notes or IBM Notes is an application that provides more than “just an email” service. Therefore, in the following write-up, readers will know about the IBM Lotus Notes and its features in a seamless way. What is IBM Lotus Notes? IBM Notes has been existing since 30 years. In 30 years, a number of version has released, and every new versions comprises some new features. The latest version of Lotus Notes is IBM Notes 9.0.1 FP10. It is a unique feature of Lotus Notes and Domino that offers data replication facilities. The client and servers can replicate, database across many types of networks. This feature offers, the user, to utilize the Lotus Notes database while being offline with the client. However, when the connection established between the client and server, all the changes made can be automatically synchronized with the server. The security measures also maintain the data in offline mode. This feature encrypts all the data file to a specified Notes ID file. Data replication feature comes in Notes 6 version and in the above one. However, new replicas are, by default, encrypted to Notes ID. Replicas can be scheduled, manually or automatically. The replication of data takes place in between the two servers and between client and server. Developers of Notes realized the importance of Security quite early. It was the first software product that uses public key cryptography widely for client-server. Now, Lotus supports only one version of the Notes PKI with 128-bit symmetric keys, 1024 bit public keys. The IBM Domino server’s security tools include S/MIME, SSL 3.0 support with industry standard key sizes for HTTP and other protocols, X.509 client certificates. Lotus Notes database is different from relational database management system (RDBMS). They are document-centric, offer multi value in fields. IBM Notes use meta data schema instead of a schema, come with built-in document level access control and store RichText data. Although Notes database can be map to RDBMS by using tools like JDBCSql for Domino or NotesSQL. The Notes document is very much analogous to an XML document natively stored in a database. 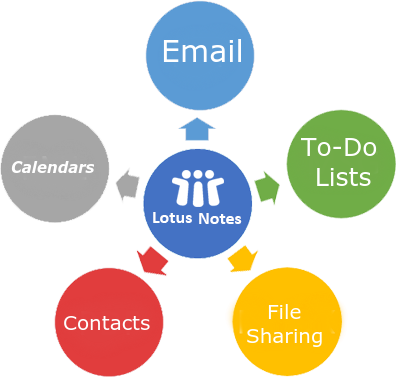 Lotus Notes commonly used as an end-user email client in an organization. It can send and receive the messages within the network. However, Lotus Domino supports POP3 and IMAP mail clients. IBM Notes also provides Domino Web Access, to allow the use of email and calendar features through Internet Explorer and Firefox browsers on Windows, Mac, and Linux platforms. Furthermore, there are several spam filtering programs available. And, a rules engine allowing user defined mail processing to be performed by the server. As everyone knows, Lotus Notes is the most popular email client among all end users. After considering the various technical aspects, we have presented the entire information to let the users understand what is Lotus Notes and its features. Along with this, we have discussed its most interesting features as well.